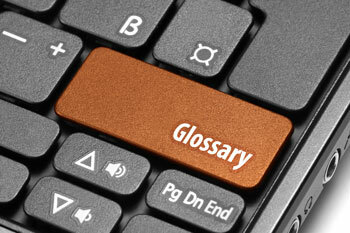 A garage door glossary comes in handy when you’re trying to describe a problem with your door. Can you name the parts of a garage door? Do you have to resort to saying “thingy” to describe problems with your door? This glossary can help. It includes the most commonly used garage-door terminology. Whether you’re working on a door yourself, or calling on us for installation or repair, use this list to learn which parts are called what. Ponderosa Garage Door and Repair is happy to help you repair, main or install a new door. Contact us for a free estimate. astragal: weather-stripping along the bottom of a garage door. back hangs: vertical supports for the horizontal track. backroom: clearance from the door to the back of the horizontal track. bottom bracket: affixed to either side of the door. Lifting cables are attached to these brackets. bracket-mounted track:a vertical track attached to the doorjamb. cable drums: part of a tension spring system. Lifting cables wind around the drum as the door opens. cable: lifting cables connect the counterbalance mechanism to the bottom bracket. clearances: amount of headroom, backroom and sideroom needed for door installation. cycle: a single cycle equals one complete opening and closing of a door. dead load: load of the door when it’s not in motion. door frame: consists of the horizontal header and side vertical pieces. double-thick glass: about ⅛ inch thick and lighter than plate glass. duplex spring: two torsion springs. extension springs: springs that stretch to produce lifting force. Extension springs stretch as the door moves. They run from a pulley to the rear-track hanger. flag bracket: connect the vertical and horizontal tracks. galvanizing: the process of coating steel with zinc to prevent rust. Steel garage doors are galvanized. garage door opener: the hardware that opens and closes a garage door. Can be operated by remote control. headroom: clearance from the top of the door opening to the ceiling or lowest obstruction. high cycle springs: high cycle springs have a longer-than-standard life cycle. horizontal track: track that runs parallel to the ceiling and guides the door as it moves. insulation: material that reduces heat or cold transmission. Polystyrene foam and polyurethane filler are types of garage door insulation. jamb seal: weather stripping around the door jamb. jambs: vertical portion of the door frame. Tracks may be mounted on the inside of a door jamb. low headroom: a garage ceiling that’s lower than standard. May require special hardware to install the door. opening size: size of door opening between masonry, walls or steel jambs. overhead garage door: a door with hinged sections that allow it to roll up and down a track. photo sensor: sensors mounted on either side of the door, several inches above the ground, that reverse the direction of an automatic door if an object is below the door. A safety feature required by law. radius: curved portion of a track. rear track hangers: attach and the horizontal track to the ceiling. roller assembly: consists of an axle and wheel or roller. Guides the door along the track. rollers: the wheel in the roller assembly. safety spring containment: an extra cable that runs through the center of an extension spring, meant to hold the spring in place if it breaks. sectional door: door made of two or more sections hinged together. shaft bearings: type of bearing that supports the weight of the counterbalance system and door. sideroom: clearance from the sides of the door opening to the nearest obstruction. spring assembly: the hardware in the counterbalance assembly. torsion spring counterbalance assembly: hardware that converts spring torque to lifting power by balancing the weight of an overhead door. torsion springs: a type of spring that allows garage doors to open and close. The springs are mounted above the door on a shaft. The springs turn the shaft and attached cables raise and lower the door. track: a rail that guides the roller assembly. Tracks run vertically on either side of the door and horizontally along the ceiling. winding cone: fits into a torsion spring allowing the spring to be wound. winding sleeves: allows the safe application of torque from a torsion spring. Retains the spring when wound or unwound and is able to withstand the forces exerted by the spring. wind load: the force of the wind as it hits a closed door.